This is one of the most brilliant of all Christ's parables, and is recognized to be a profound revelation of repentance and forgiveness. The episode of the elder son is no less revealing than the departure and return of the younger son. This is the divine friendship, the incomparable revelation of this parable. Even the best of fathers is rare. Who is able to be this forgiving? A father with this much love, this much unconditional love. The heart of man is far less paternal than the heart of God! Christ is making a second point: If the father has experienced an exuberant joy for the younger son who has withdrawn, returned and repented, the father feels no less for the eldest son whom he has kept always with him, and whom he desires to share much more than a day's feast. 32 It was meet that we should make merry, and be glad: for this thy brother was dead, and is alive again; and was lost, and is found." Rembrandt is as much the elder son of the parable as he is the younger. When, during the last years of his life, he painted both sons in Return of the Prodigal Son, he had lived a life in which neither the lostness of the younger son nor the lostness of the elder son was alien to him. Both needed healing and forgiveness. Both needed to come home. Both needed the embrace of a forgiving father. 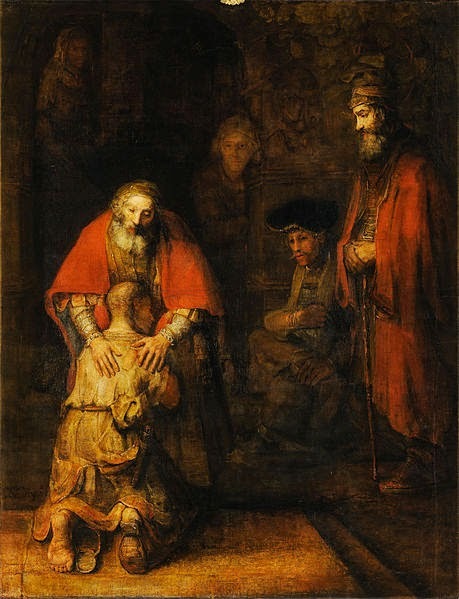 But from the story itself, as well as from Rembrandt's painting, it is clear that the hardest conversion to go through is the conversion of the one who stayed home.